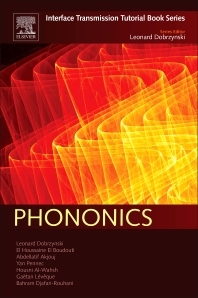 Phononics: Interface Transmission Tutorial Book Series provides an investigation of modern systems that includes a discrete matrix description. Classical continuous systems relying on the use of differential equations are recalled, showing that they generally have a specific limit on their corresponding modern matrix formulation. A detailed description of the mathematical languages that enables readers to find the composite system linear transmission properties is provided in the appendix. The physical model is described with exacting detail, and the bibliography is built to cite—in chronological order—all the scientists that have contributed over many years. Each volume is written with the aim of providing an up-to-date and concise summary of the present knowledge of interface transmission science, thus fostering the exchange of ideas among scientists interested in different aspects of interface transmission. The book serves as an introduction to advanced graduate students, researchers, and scientists with little study on the subject, and is also useful to help keep specialists informed on general progress in the field. Professor Leonard Dobrzynski obtained his Diploma d' Etudes Physics and his Doctorate from the University Paris, France.He started his professional career at the National Centre for Scientific Research, University of California, Irvine, followed by the National Center for Scientific Research, Grenoble and Lille, France. Further he became research director in Lille and Madrid, Maitre de Conferences FUPL, Lille, and Professor of Physics at the Federation University and Polytechnique de Lille. Since 2008 he has been Emeritus Research Director. He is a recipient of the Prix Special, Society des Sciences, Lille, and a member of the Society Francaise Physique, Society Europeenne de Physique. He is Editor of the journal Surface Science Reports, Editor of Handbook of Surfaces and Interfaces, and co-author of Surface Phonons and Polaritons. He has published 251 articles in international scientific journals. Dr. El Houssaine El Boudouti is a Professor in the Department of Physics, Université Mohamed I, Oujda, Morocco. Dr. Abdellatif Akjouj is a Professor at the National Center for Scientific Research, Lille University 1, France. He received a PhD in Physics from the University of Science and Technology in Lille, France. He is a co-author of more than 130 research publications and wrote several book chapters in subjects related to nanotechnology, nanoplasmonics, biosensors, and magnonics and phononics circuits. Dr. Yan Pennec is a Professor at the National Center for Scientific Research, Lille University 1, Villeneuve d'Ascq, France. Dr. Housni Al-Wahsh is a Professor in the Department of Mathematical & Physical Engineering, Benha University, Egypt. Dr. Gaëtan Lévêque is a Professor at the National Center for Scientific Research, Lille University 1, Villeneuve d'Ascq, France. Dr. Bahram Djafari-Rouhani is a Professor at the National Center for Scientific Research, Lille University 1, Villeneuve d'Ascq, France.